The Avaya IP Office 500; recognising you are different. Avaya IP Office 500 is a phone system consisting of a server and operating system. The hardware, the Avaya IP Office 500 is a self contained 2RU (rack unit) appliance. The operating system is currently Release 9.1. There is also a suite of accompanying software available such as Voicemail Pro, Voicemail Pro Client, Softconsole, Phone Manager and IP Office Manager. IP Office 500 has four bays on the front of the unit. Each bay capable of accepting two modules, giving a total of up to 8 modules. The main benefit of this is flexibility. This gives the ability to mix and match modules as you need them to suit your environment. 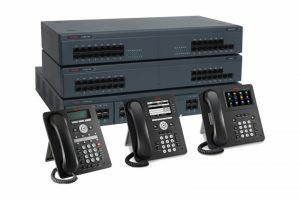 Modules are available such as ISDN, standard telephone lines, ATM modules (for dedicated data connections) and dedicated ports for connecting Avaya digital phones. The software client IP Office Manager is supplied to configure all aspects of the server. The windows and menus are laid out in a very logical and easy to use manner. The main strength of IP Office is its scalability. You can start off with one server and a couple of modules. As your business grows you are free to add more modules and expansion units to cope with the physical connections. There is a very comprehensive suite of software for the IP Office 500. The three main ones being Voicemail Pro, Phone Manager and Softconsole. Voicemail Pro adds additional features to the existing Voicemail on the IP office 500, such as Auto Attendant and other phone automation for small businesses. Phone Manager and Softconsole are for end-users such as receptionists and administration areas. Phone Manager provides direct access to features such as group user information, instant messaging and an address book. Softconsole is a tool tailored for receptionists providing greater information on the status of phone queues and checking which users are available. In summary, the IP Office 500 from Avaya is completely modular. It scales extremely well allowing additional phones and modules to be added to the system as and when required. This system is perfect for anyone looking for enterprise-grade functionality without having the associated big business costs. If you want to know more please leave us your details and we will contact you for an informal chat. For more information on other Avaya products please visit their website here.